The Xclaim Pyramid fabric popup is an eye catching and versatile display perfect for tradeshow events. Add dimension to your event or tradeshow with unique, exciting graphic styles. The Xclaim is easy to setup, lightweight and portable. With a collapsible popup frame and magnetic connectors, the Xclaim has one of the fastest display setup times available. Stretch fabric graphics come pre-attached to the frame, making assembly even easier. Graphics adhere to the hubs using push-fit attachment technology. 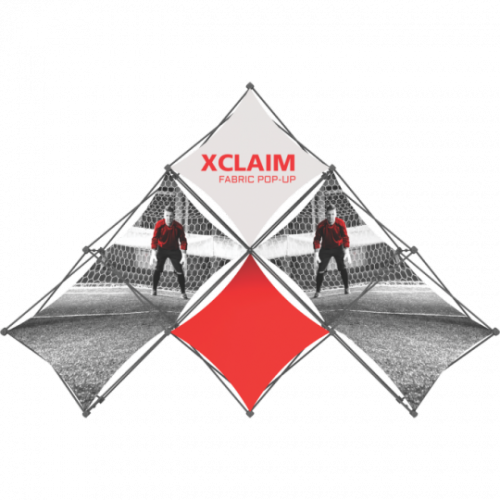 The Xclaim comes with graphics, frame and drawstring carry bag. Xclaim Popup Pyramid 14ft 10 Quad Fabric Popup Kit 03 - Expression style boothThe Xclaim Pyramid mu..